In April 2012, a Kansas SWAT team raided the home of Robert and Addie Harte, their 7-year-old daughter and their 13-year-old son. The couple, both former CIA analysts, awoke to pounding at the door. When Robert Harte answered, SWAT agents flooded the home. He was told to lie on the floor. When Addie Harte came out to see what was going on, she saw her husband on his stomach as SWAT cop stood over him with a gun. The family was then held at gunpoint for more than two hours while the police searched their home. Though they claimed to be looking for evidence of a major marijuana growing operation, they later stated that they knew within about 20 minutes that they wouldn’t find any such operation. So they switched to search for evidence of “personal use.” They found no evidence of any criminal activity. The deputies repeatedly found “saturated plant material” that they thought could possibly be marijuana. On two occasions, a drug testing field kit inexplicably indicated the presence of THC, the active drug in marijuana. It was on the basis of those tests and Harte’s patronage of a gardening store that the police obtained the warrant for the SWAT raid. But, of course, they found nothing. Lab tests would later reveal that the “saturated plant material” was actually loose-leaf tea, which Addie Harte drinks on a regular basis. Why did the field tests come up positive for pot? As I wrote back in February, it’s almost as if these tests come up positive whenever the police need them to. A partial list of substances that the tests have mistaken for illegal drugs would include sage, chocolate chip cookies, motor oil, spearmint, soap, tortilla dough, deodorant, billiard’s chalk, patchouli, flour, eucalyptus, breath mints, Jolly Ranchers and vitamins. Once they had been cleared of any wrongdoing, the Hartes wanted to know what happened. Why had they been raided? What possible probable cause could the police have had for sending a SWAT team into their home first thing in the morning? But even that information would prove difficult to obtain. Under Kansas law, the sheriff’s department wasn’t obligated to turn over any information related to the raid — not to the Hartes, not to the media, not to anyone. The couple eventually had to hire an attorney to get a judge to order the sheriff to release the information. They spent more than $25,000 in legal fees just to learn why the sheriff had sent a SWAT team into their home. Once they finally had that information, the Hartes filed a lawsuit. Last week, U.S. District Court Judge John W. Lungstrum dismissed every one of the Hartes’s claims. Harte found that sending a SWAT team into a home first thing in the morning based on no more than a positive field test and spotting a suspect at a gardening store was not a violation of the Fourth Amendment. He found that the police had probable cause for the search, and that the way the search was conducted did not constitute excessive force. He found that the Hartes had not been defamed by the raid or by the publicity surrounding it. He also ruled that the police were under no obligation to know that drug testing field kits are inaccurate, nor were they obligated to wait for the more accurate lab tests before conducting the SWAT raid. The only way they’d have a claim would be if they could show that the police lied about the results, deliberately manipulated the tests or showed a reckless disregard for the truth — and he ruled that the Hartes had failed to do so. And stuff like this just happens all the time. And because it happens all the time, most of us (Thank God for Radley Balko), just don’t even pay any attention. If news covered stuff that actually mattered, we’d have stuff like this and the abomination that is civil forfeiture on there all the time and a lot less mayhem and gossip. But, in the end, this is our war on drugs until we force the politicians to change it or change the politicians in power over this. The Know-Nothings are my absolute favorite historical American political party. Among other things, as a Catholic, I’ve always taken a perverse enjoyment in their rabid anti-Catholicism. I love surprising my students every semester by explaining that a political party was remarkably successful in the 1850’s while being amazingly, overtly xenophobic. Anyway, as John Cassidy makes the (obvious) Trump comparison, I could not resist sharing the best parts (and the nice Know Nothing history for those of you who know nothing– or little– about Know-Nothings). Trump, for reasons that historians have rightly emphasized, shouldn’t be compared to a Goebbels or a Mussolini on this front. But, in the six months since he launched his campaign, he has revived the Know-Nothing movement, plumbed new depths of divisive rhetoric, and established himself as a shameless demagogue. With five weeks left until the first vote is cast in Iowa, that is more than enough to be getting along with. Anyway, great stuff. Not much for me to add. McGinty’s office made the case for the non-indictment during an extended press conference this afternoon. But the central concept in the case—the one that it is crucial to understanding the grand jury’s reasoning—was never mentioned. That concept is known in law enforcement circles as “officer-created jeopardy”: situations in which police officers are responsible for needlessly putting themselves in danger, committing an unforced tactical error that makes them vulnerable—and then using deadly force to protect themselves. Here’s how “officer-created jeopardy” relates to the death of Tamir Rice. As security footage of the shooting shows, Loehmann and Garmback’s car didn’t come to a stop until it was right next to Rice. In fact, the video indicates that the car was still moving when Loehmann opened the passenger side door and jumped out. Faced with a suspect they believed to be armed, in other words, Loehmann and Garmback decided to drive right up to him—thereby exposing themselves to the possibility that Rice could open fire on them with almost no warning. The question the grand jurors had to answer, then, was whether to take that decision into account when determining the legality of the officers’ actions. Did it matter that no one forced Loehmann and Garmback to approach their suspect so aggressively? Did it matter that, by approaching him the way they did, they were the ones who had created the situation in which it then became necessary, in Loehmann’s view at least, to use deadly force? And then a nice discussion of the complex legal issues and interpretations. It does seem to me, though, that even if officer-created jeopardy” is not in legal play in should be in administrative play and no way does an officer who acted so foolishly to create a situation where he felt (supposedly reasonably) that he had to shoot somebody just get off completely. There’s just no way that police officers who behave in this manner should continue to be police officers. It would be nice if we could at least agree on that. Strip away the rhetoric, and McGinty [Cuyahoga County prosecutor] has made a clear statement about police conduct: If police perceive a threat to their lives then they’ve de facto justified their actions regardless of context, even if it ends with taking the life of a child. That includes situations like the Rice shooting, where police chose to create a confrontation, rather than manage an encounter. What we see with Tamir Rice—and what we’ve seen in shootings across the country—is what happens when the officer’s safety supercedes the obligation to accept risk. If “going home” is what matters—and risk is unacceptable—then the instant use of lethal force makes sense. It’s the only thing that guarantees complete safety from harm. Unaccountable lethal force defines contemporary law enforcement, at least for black Americans and other minorities, and barring a sea change in attitudes among the majority of Americans, there’s little reason to think that will change. Yes, yes, yes! Hopefully some good will come from this, but really, if we really want change in police shootings and police accountability it is long past time to re-think our conceptualization of police and public safety. 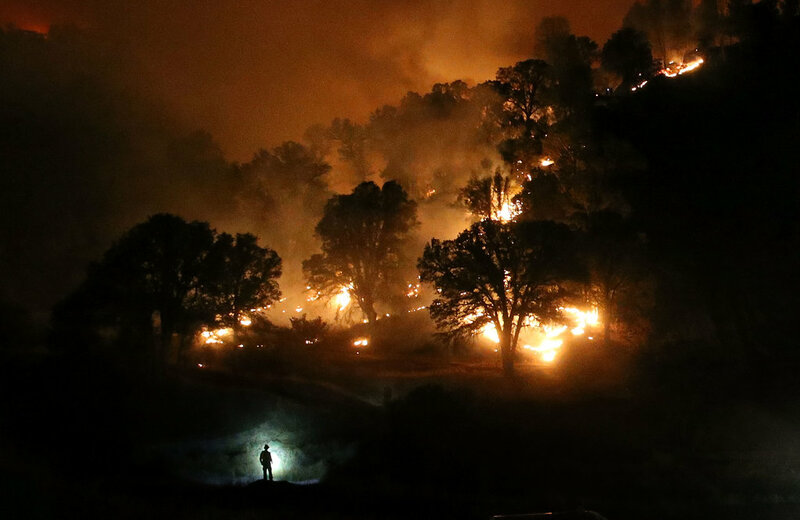 A firefighter was silhouetted by his headlamp as he battled the Rocky Fire, a wildfire that spread over three counties and burned over 60,000 acres. 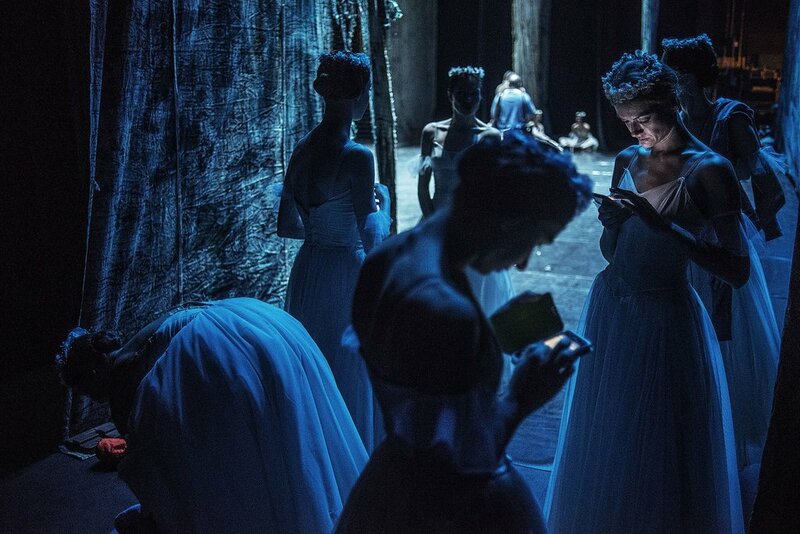 St. Petersburg Ballet Theater dancers took a break before a show during their global season tour. With a more than 90 percent success rate, the researchers were able to predict whether the participants were conservative or liberals based on how regions of their brains lit up while viewing the images. And it turned out that conservatives had a much stronger reaction to disgusting images than liberals. Reactions to other types of images were not predicted by political views. Actually, just the other day I was out with my two way-too-easily-disgusted sons and saying that I was worried they might end up Republicans because of this personality trait. They are both plenty liberal now (especially so on environmental issues), but if they end up conservative, I will be blaming their heightened sense of disgust.